As Others See Us, first published in 1994 by Gordon & Breach, is a book designed to introduce the reader to a new way of thinking about the movements, both conscious and unconscious, that we make every day and every second of our lives. Goldman describes the human experience as a continuous stream of body movements, though we are only aware of a small fraction of the more obvious and intrusive physical acts. 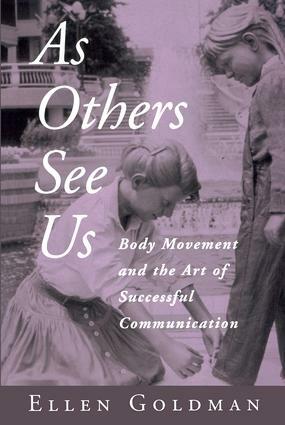 The aim of this book is first to increase awareness of the subtleties and complexities of our body language, and then to encourage the reader to perceive these intricacies in their own movements and in those of others. Finally, with a more complete understanding and appreciation for the power of body language and non-verbal communication, one can achieve a deeper connection between physical and intellectual spheres, to allow for a fuller and more engaging experience of communication and expression. This new knowledge of the human body's movements not only permits one to more accurately perceive the emotions and thoughts of others, but can allow a glimpse into one's own mind, to see how we present ourselves to the world, and whether our thoughts are in sync with our actions. Central to the text is the author's treatment of the Integrated Movement, a term used to describe the merger of a posture and a gesture with a consistent quality, dynamic or shape. This approach to understanding and explaining human movement offers a unique way of thinking about conscious gesture, unconscious body language, and verbal speech as interconnected communication, a synthesis that allows for a more complete view of ourselves and others around us. The structure of the book follows a logical framework that mirrors the progress of the reader, from perception of movement, to the close inspection of gesture and body language, to the introduction and experience of Integrated Movement, to the application of one's new awareness to different aspects of life. Biographical sketches of leading figures in the field are included, as are suggestions for additional reading and resources. Perhaps the most unique feature of the book are the personal exercises (boxed-off text) that appear on almost every other page. These exercises are designed to allow the reader to experience the power of body language in real-life situations, while working towards the increased awareness and perception that is the goal of the book. Prologue. Perceiving Movement. Looking at Movement: Gestures and Postures. Integrated Movement: The Moment of Truth. Experiencing Integrated Movement. Friendship. Relationships. Family. Getting to Work. The Body. The Art of Life, Posture, Gesture and Integrated Movement in Art. Reflections. Epilogue: Our Quantam Leap. Ellen Goldman, Certified Movement Analyst (CMA), is a leader in the field of movement analysis, having made the study of movement her life's work. Early dance training led to an avid interest in choreography, performance and the establishment of a dance company. She is co-founder of New York's respected Laban/Bertenieff Institute of Movement Studies, where she has spent over thirteen years as an instructor in the Certification Program. She is considered a central force in Laban Movement Analysis. Ms. Goldman is currently in private practice in Manhattan, offering services in Management Assessment, Career Planning, and Communication Skills.